Pinan Nidan deals mostly with someone who has hold of your wrist or lower arm using the opposite side of their body. i.e. cross body grips. Very common when someone wishes to punch you for them to grab you with their non punching hand first. If you have a guard up or "fence" then they are likely to grab your forward arm. Heian Shodan variant, Turn to the left 90°and execute gedan-barai in zenkutsu-dachi. Step forward in zenkutsu-dachi and execute oi-tsuki chudan. Turn 180° to your right and execute gedan-barai as you turn, end in zenkutsu-dachi facing the opposite direction. Shorten your stance from zenkutsu-dachi to Renoji or Teiji dachi and begin the execution of tettsui-uchi. Step forward into zenkutsu-dachi and execute oi-tsuki. Turn left 90° to the front and execute gedan-barai with your left leg and left arm. Step forward with your right arm and leg in zenkutsu-dachi and execute age-uke to the front. Step forward with your left arm and leg in zenkutsu-dachi and execute age-uke to the front. Rotate 225° anti-clockwise and execute gedan-barai at 45° degrees. Execute oi-tsuki at 45° in zenkutsu-dachi. Execute gedan-barai to the right at 90° degrees to the right in zenkutsu-dachi. Execute oi-tsuki at 45° in zenkutsu-dachi to the right with left foot and arm forward. 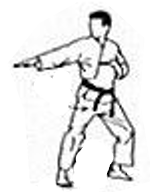 Execute gedan-barai to the left at 45° degrees in zenkutsu-dachi with left leg and arm forward. Execute oi-tsuki chudan in zenkutsu-dachi with right leg and arm forward. Execute oi-tsuki chudan in zenkutsu-dachi with left leg and arm forward. Rotate 225° and execute shuto gedan-barai in shiko-dachi. Shorin styles tend to rotate 270° and execute the shuto in a back or cat stance rather than straddle stance. 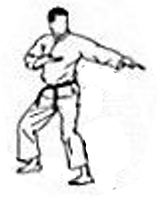 Shotokan use a regular shuto-uke rather than a shuto gedan-barai. Step out at 45° and execute another shuto gedan-barai in shiko-dachi with the right leg and arm forward. 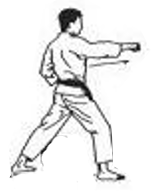 Step across at 90° and execute shuto gedan-barai in shiko-dachi with the right leg and arm forward. 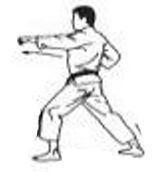 Step out at 45° and execute another shuto gedan-barai in shiko-dachi with the left leg and arm forward.